The City of Williamsburg is located on the Virginia Peninsula. The city is a combination of a modern community and Colonial Williamsburg. Williamsburg, together with Jamestown and Yorktown, form the Historic Triangle, an area that contains many of the nation’s most treasured historic landmarks. Colonial Williamsburg is one of the nation’s foremost living history museums. The Historic Area includes a mix of restored and replica buildings related to colonial American history. Colonial Williamsburg is designated a National Historic Landmark District. 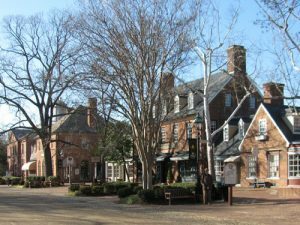 Williamsburg is also home to Abby Aldrich Rockefeller Folk Art Museum, DeWitt Wallace Decorative Arts Museum, Virginia Musical Museum, and Muscarelle Museum of Art (College of William and Mary). Nearby, Busch Gardens and Water Country USA are major attractions. Williamsburg is home to the College of William & Mary, the second oldest college in the USA.